The University Of Miami (also known as UM or U of M) is one of the most frequently searched universities in America, according to a recent internet keyword search of American colleges. U of M is a private research university in Coral Gables, Florida. Established in 1925, the college currently serves an enrollment of roughly 17,000 students, with more undergraduates than post graduates in attendance. The acceptance rate at U of M is approximately 38 percent. To get accepted, most students need an unweighted high school GPA of 3.7 or better, with an SAT score of at least 1300. The university is accredited by the Southern Association of Colleges and Schools. Notable UM graduates include actor Sylvester Stallone, singer Grace Slick, and singer Gloria Estefan, as well as many top athletes and CEOs, among others. Above: The UM logo sculpture is a useful campus landmark. Here are the answers to some of the most frequently asked questions about U of M.
1. Where is the University of Miami? 2. What types of degrees are offered at the University of Miami? UM offers many Bachelors degrees, Masters degrees, and dozens of Doctoral degrees (PhD) in a broad variety of fields. The college also has a law school and a medical school. 3. What undergraduate majors are offered at the University of Miami? UM offers more than 180 undergraduate majors. 4. What graduate programs are available at the University of Miami? Graduate studies can be taken at any of the colleges schools. Among these studies are law and medicine. Other graduate degree programs include biology, computer science, education, health sciences, marine sciences, and advanced music studies. Click here for a list of the Doctoral (PhD) programs at UM. 5. What programs are available at the University of Miami College of Law? 6. 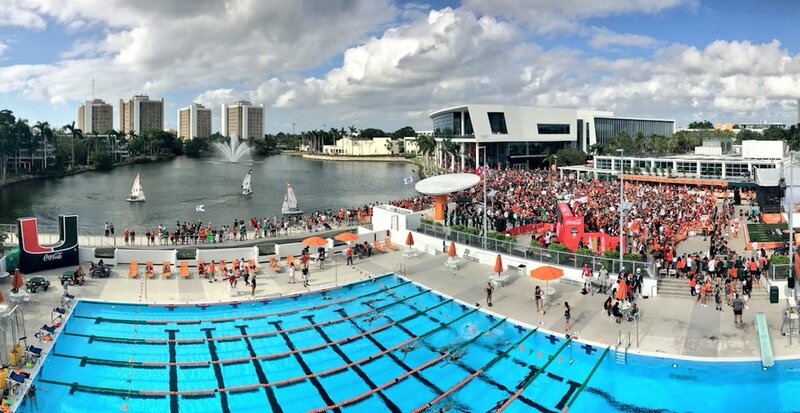 How much does it cost to attend the University of Miami? According to the UM website, the current estimated cost of enrollment for an undergraduate to attend the school full time is roughly $49,000 in tuition, and approximately $1,500 in fees. Also factor in living expenses, supplies, transportation, and personal items. With all expenses included, the total cost of attendance (COA) is about $70,000 for the academic year. Additional fees may also apply, such as application fees, registration fees, technology fees, insurance fees, parking fees, and others. Many students applying to UM are eligible for financial aid, as long as they successfully complete and submit the FAFSA form. Graduate financial aid may also be available. 7. What is the University of Miami campus like? The main campus of UM in Coral Gables spans 239 suburban acres, on the north side of US Highway 1, along the shores of Lake Osceola. 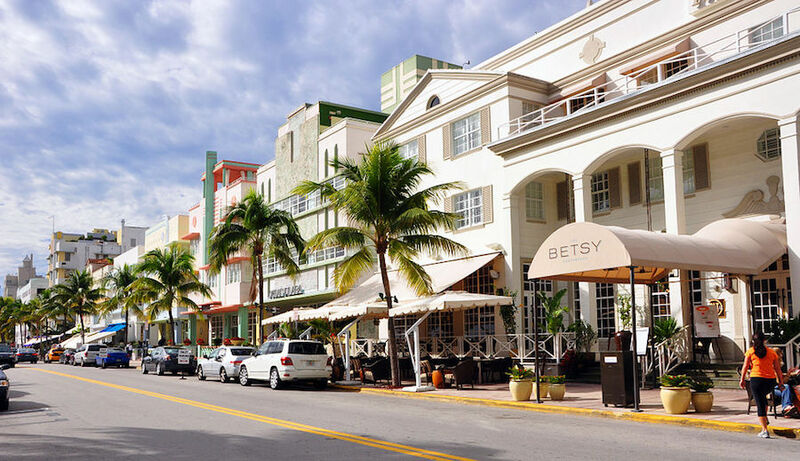 Coral Gables is situated only about 5 miles southwest of downtown Miami. Student housing is available, both on and off campus. Public transportation is provided by a local rail service, in addition to the city buses. The athletic teams at U of M are called the Hurricanes. They play for Division I of the the NCAA - Atlantic Coast Conference (ACC). The school colors are orange, green, and white. Other campus activities include a variety of student interest groups, such as a salsa dance club, a volunteer community service organization, a film festival group, a student newspaper, and a campus radio station, to name just a few of many. Above: The UM cheer and dance teams. Above: The Hurricanes in action. 8. 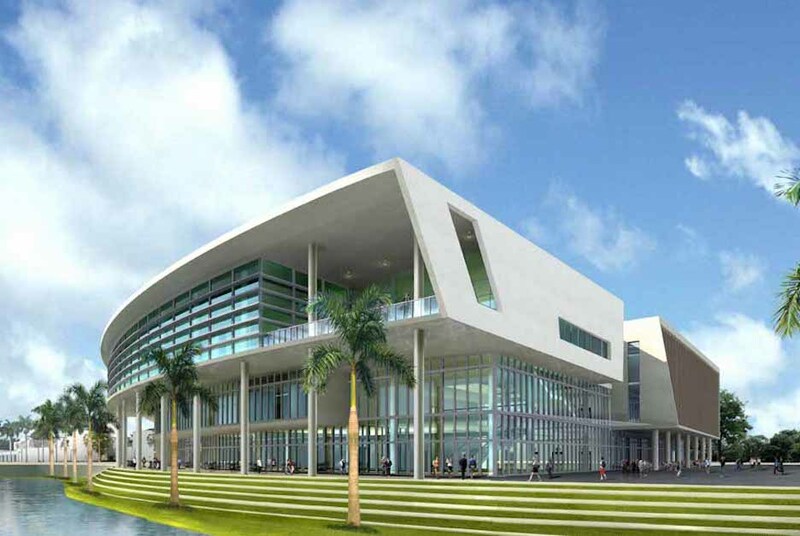 What are the distance learning options at the University of Miami? Call the number shown below to inquire about distance learning opportunities at U of M.
9. 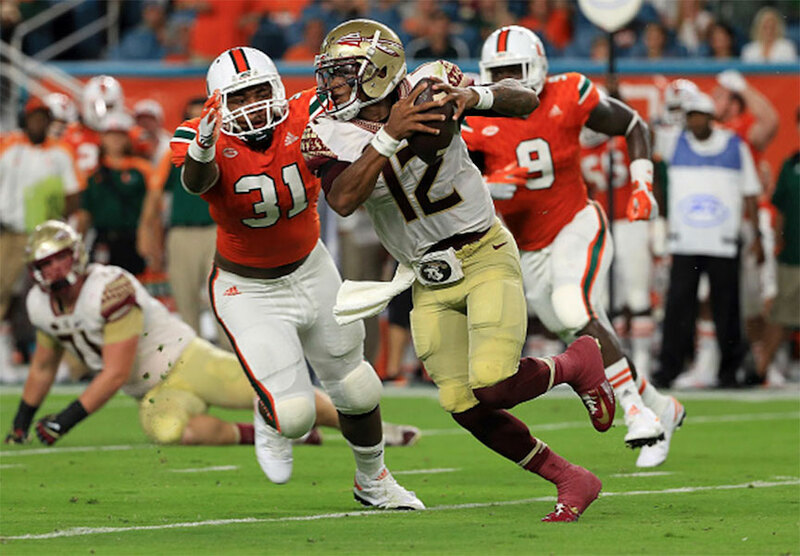 What is the contact information for the University of Miami? 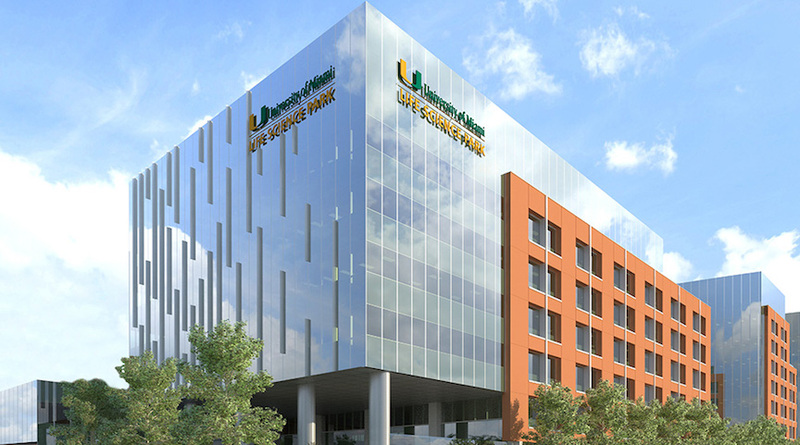 You can reach the main campus office of UM in Coral Gables by calling 305-284-2211. To reach the office of undergraduate admissions, call 305-284-6000. To speak with someone at the U of M school of law, call 305-284-2339.